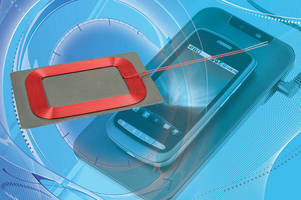 Wireless Charging Receiving Coil is WPC compliant. Optimized for use with or without alignment magnet, Vishay Dale IWAS-4832EC-50 Rx coil delivers efficiency >75% for wireless charging of 7 V portable electronics. High-saturation (50% of inductance at 4000 gauss) powdered iron is not affected by permanent locating magnets. With lead length of 50 mm and tinned length of 10 mm, Wireless Power Consortium-compliant coil features inductance of 16.2 ÂµH at 200 kHz with Â±5 % inductance tolerance, DCR of 366 mΩ at +25Â°C, and Q of 30 min at 200 kHz. MALVERN, Pa. – Vishay Intertechnology, Inc. (NYSE: VSH) today announced a new powdered-iron-based, WPC-compliant (Wireless Power Consortium) wireless charging receiving coil optimized for use with or without an alignment magnet. Offering a durable construction and high permeability shielding, the new IWAS-4832EC-50 provides high efficiency greater than 75 % for the wireless charging of 7 V portable electronics. The Vishay Dale Rx coil released today has been designed into a leading wireless power development kit. For higher-voltage wireless power base stations and receivers, the IWAS-4832EC-50's high-saturation powdered iron is not affected by permanent locating magnets, and the device blocks charging flux from sensitive components or batteries. As an alternative to ferrite-based solutions, which can saturate in the presence of a strong magnetic field, the IWAS-4832EC-50 has magnetic saturation of 50 % of inductance at 4000 gauss. The RoHS-compliant device features inductance of 16.2 µH at 200 kHz with a ± 5 % inductance tolerance, DCR of 366 mΩ at + 25 °C, and Q of 30 min. at 200 kHz. The device features a lead length of 50 mm and tinned length of 10 mm. Samples and production quantities of the IWAS-4832EC-50 Rx coil are available now, with lead times of stock to six weeks. Pricing for U.S. delivery only is $1.50 per piece in 10,000-piece quantities.